The holidays give busy families a much-needed opportunity to pause and spend quality time together. For adult children with aging parents, the holidays also provide a golden opportunity to assess how well their elderly parents are managing the routine tasks of daily living. Whether your elderly loved one resides at home or in a Maine assisted living or nursing facility, the time spent together during the holidays can be used to gather important information about your loved one’s general health and well being. Weight loss – can signal depression, hidden medical conditions, physical difficulties (inability to cook or drive to the grocery store) or memory loss (simply forgetting to eat). Weight gain – can also signal depression, underlying medical conditions (diabetes), poor eating habits (such as an over-reliance on convenience foods if cooking or driving to the store has become difficult). Bumps, bruises and band-aids – may be a serious sign your loved one has been having more falls. If they reside in a nursing home, this is a particular cause for concern and reason to ask lots of questions. When, how and why are the falls occurring? Is there enough staff assigned to your elderly loved one? Do they need additional assistance in bathing, dressing or eating? Is their living area safe, clean, well lit and free of tripping/slipping hazards? Are calls for help answered promptly? Refusal to try new activities – if your elderly loved one becomes angry, agitated or withdrawn when you invite them to try a new card game or join in a family sing-along, this may be a sign of early onset dementia (or another emotional or physical difficulty). New tasks are often extremely challenging and disconcerting for those experiencing early memory loss. If a loved one suddenly seems withdrawn, depressed or exhibits marked changes in personality, seek the advice of a qualified medical professional. Changes in appearance – if personal grooming habits have fallen by the wayside, it could mean your elderly loved one is having difficulty bathing, dressing, getting out for haircuts or is suffering from depression or a serious medical condition. Unopened mail, unread magazines, and newspapers – potential signs that bill paying has become overwhelming and confusing (this can be due to a combination of neurological or physical issues). Clutter around the house – plants or animals that aren’t well tended, broken appliances or spills and stains around the house are often signs that your loved one can no longer keep up with general housekeeping and chores on their own. Signs of impaired driving – dents/nicks in car, unsafe driving behavior (tailgating, distracted driving, refusal to wear a seatbelt, driving too slow or fast), refuses to follow basic rules of the road (can signal early dementia), tension while driving (turns off radio, doesn’t want to talk to you while driving). These are all concerning symptoms, possibly signaling a much deeper physical, medical or psychological problem. General eating habits – take note of the foods your loved one keeps in the kitchen. Are there lots of items past their expiration dates in the refrigerator or cupboards? Have they been relying on take-out more often, or is their freezer stuffed with frozen meals? Make sure they are eating well, have access to nutritious foods, and that they are physically able to shop and cook. Is there any evidence of fire in the house, especially in the kitchen? Scorched pots or pans are a dangerous signal of forgetfulness. Any evidence of fire in the home is a serious sign that your loved one needs a physical and neurological assessment by a qualified elder care physician. Memory loss– are there signs that your loved one has forgotten how to do routine tasks (such as making coffee, using the phone, dressing) while easily remembering others, is asking the same question repeatedly and or is forgetting the details/dates of important events? These can be subtle and easily missed signs of memory loss and dementia. However, your loved one may try to mask their difficulties remembering, or they may be unaware they are experiencing problems at all. In the early stages of diseases such as Alzheimer’s, memory problems may appear sporadically, or appear as emotional problems. A qualified medical professional or neuropsychologist can give you an accurate picture of your loved one’s cognitive and emotional well being, and give you strategies and recommendations for dealing with their particular challenges. Changes in demeanor and attitude – if your loved one becomes irritated easily, shows signs of depression, agitation or tension, seek professional help. These are often signs of underlying age related medical, cognitive, physical and emotional issues that should not be left untreated. If your loved one seems “off” – talks about dying, has an abnormal number of fears (excessive concern about their pets, grandchildren, loved ones, world events, etc), seek professional help. They may be crying out for help, and it is our duty to answer that call. 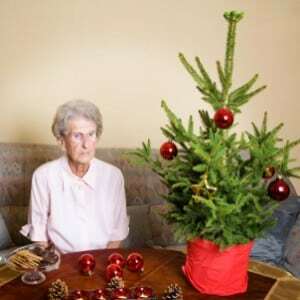 When spending time together this holiday season, be sure to give your elderly loved ones extra care and attention. As we age, it can become difficult to express unmet needs, feelings and emotions. So it is up to friends and family members to be the eyes and ears and voices for our elderly friends and family members. Watch carefully for subtle signs that your elderly loved one needs extra help, or is at risk in any way. Talk with your elderly friend or family member. Make an appointment with a qualified medical professional to ensure that they stay safe. Make sure they are getting the excellent care they deserve, whether they live at home, in an assisted living or a nursing facility. Do not take their silence or assurances of “Oh, I’m fine” as an answer if you sense in your gut that something is wrong. The attorneys at Hardy, Wolf and Downing want you and your family to share the very best of times together during this holiday season. Our firm is dedicated to protecting the elderly. If you suspect elder or nursing home abuse, please contact the personal injury attorneys at Hardy, Wolf and Downing immediately. We are experienced personal injury attorneys who know how to handle nursing home abuse cases with the sensitivity, skill and expertise required to win cases and secure justice for seniors.